Well, …. me. I gave this estimate to a Bloomberg journalist based in New Delhi who had got hold of me through some previous coverage of our concept of ‘microlives’ applied to air pollution. An authoritative study in the New England Journal of Medicine examined changes over 40 years of fine-particulate data in 211 counties in the USA, and estimated that a decrease of 10 μg/m3 in PM2.5 (fine particulates) in living environment is associated with a gain of 0.61 years in life expectancy. This corresponds to around 1% of an adult life of say 55 years, and so, looking at it from a negative point-of-view, we could also say that living somewhere with an increase of 10 μg/m3 in PM2.5 is associated with around 1% off your life expectancy. 1% of a day is 15 minutes. So, pro-rata, exposure to an extra 10 μg/m3 in PM2.5 is equivalent to losing 15 minutes off your life expectancy per day. We can now make a comparison between any two cities, say Washington (average daily exposure 15 μg/m3 of PM2.5), and Delhi (average 84 μg/m3 of PM2.5 during Obama's visit). The difference is around 70 μg/m3, so noting from point (1) that an additional 10 μg/m3 loses 0.61 years, this difference of 70 μg/m3 would take roughly 7 x 0.61 = 4 years off an average permanent resident’s life. So each day’s exposure to this is as if it takes 2 hours off their life. 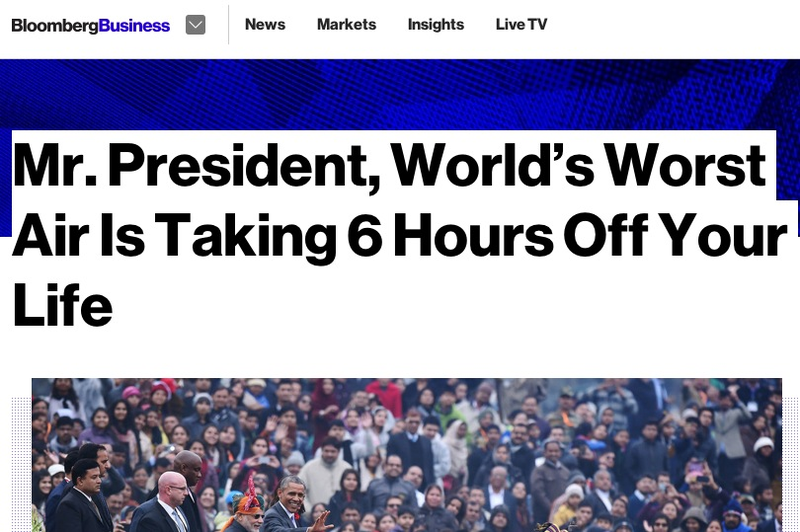 Using this metric, Obama’s 3-day stay could be considered as taking 6 hours off his life expectancy. We can also make a comparison with cigarette smoking. Smoking 20 cigarettes a day takes around 10 years off your life-expectancy, say 20% of an adult lifetime. So, again pro-rata, it’s as if a daily cigarette is taking 1% off your life-expectancy, or 15 minutes each day. Thus, very roughly, a day exposed to an additional 10 μg/m3 in PM2.5 is equivalent to smoking a cigarette. So a day in Delhi at 84 μg/m3 of PM2.5 is equivalent to smoking around 7 or 8 cigarettes, and so Obama's visit could be considered as roughly equivalent to 20 to 24 cigarettes. According to Bloomberg, Delhi averaged a rather frightening 157 μg/m3 of PM2.5 in 2013. Compared to Washington, or London, this is around 140 μg/m3 higher, equivalent to 14 cigarattes a day, around 8 years off your life, or 3.5 hours off for each day. Another way of looking at this is that the residents of Delhi are going towards their deaths at around 27 or 28 hours each day, rather than the standard 24. An alternative way of describing this is through the ‘microlife’. Since 57 years, around an adult lifetime, is a million 1/2 –hours, we can consider losing 30 minutes life expectancy is essentially costing you a millionth of your adult life, or what we call a ‘microlife’. Thus 2 cigarettes, or around 6 hours in Delhi during Obama's stay, is equivalent to losing a microlife, and an average day in Delhi may be about 4 to 7 microlives, depending on the PM2.5 levels. See Wikipedia article and this British Medical Journal paper for more discussion and examples. To try and pre-empt criticism, I fully understand that I am committing two cardinal sins of epidemiology. First, I am, at least implicitly, implying causality where the data can only provide an association. However the causal harm of cigarettes is now undisputed, while that of fine particulates is fairly non-controverisal (and the New England Journal of Medicine study is longitudinal). Second, and more important, I am taking measures that have been derived from large populations followed over long periods, and applying them to individuals experiencing a single day. But I regard this as a valid form of ‘numerical metaphor’. It is not literally true, as it is impossible to say what the effect of a short stay in Delhi was on Barack Obama’s long-term health. I certainly cannot prove he lost six hours life-expectancy. But I bet it didn't do him any good. This is an unashamedly 'popular' way of communicating chronic risk. And judging by the large additional coverage of this story, it seems to have worked. And I should add that I really like Delhi, and will be back there in the autumn, in spite of the air.